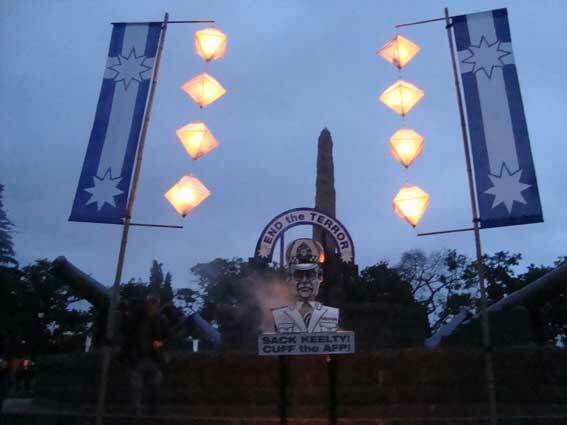 Just before first light, a cold wind came up and, blowing around the blue stone Eureka Memorial that marks the hallowed ground where blood was spilled defending rights and liberties 154 years ago, it chilled us all. Thirty of us and we were activist pilgrims gathered to reclaim the radical tradition of the gold field rebellion of 1854, to honour the ancestors, to tell the stories and to bear witness to the big changes that followed their courage, their struggle and their sacrifice. We were young adults, children, middle aged and elderly, men and women: some had come from Ballarat, some had come from Gippsland but most were from Melbourne gathered by Dr Joe Toscano of the Anarchist Media Institute via his weekly broadcasts on public radio 3SER and his newsletter, the Anarchist Age Weekly Review. The ninth annual Eureka dawn observance of the Dr Joe's Reclaim the Radical Spirit of Eureka project, it was a full and long day of story telling events which included a flag bearing march from the Eureka Memorial to the old Ballarat cemetery and the gravesides of the Eureka dead, diggers and soldiers; the awarding of Eureka Medals at Bakery Hill to honour the service of nominated activists; a protest outside Ballarat Town Hall calling for the City to honour the Eureka dead by flying the Eureka Southern Cross uppermost on the grand old 19th century Town Hall town tower on 3 December each year: and a visit to the Ballarat Fine Arts Gallery to pay respects to the original Eureka flag. 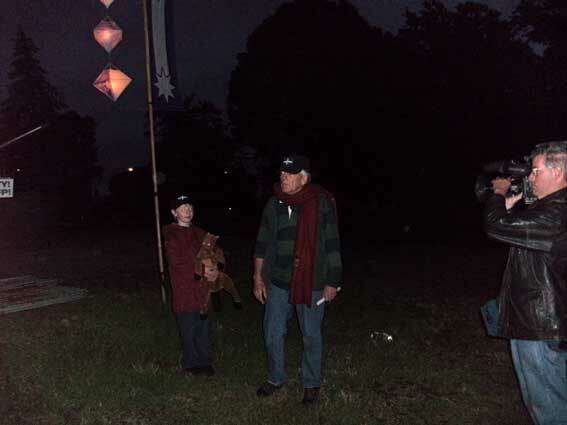 The observance began at 4 am with a lantern lit circle by the Memorial and each participant was invited to introduce themselves and say what the Eureka rebellion meant to them. 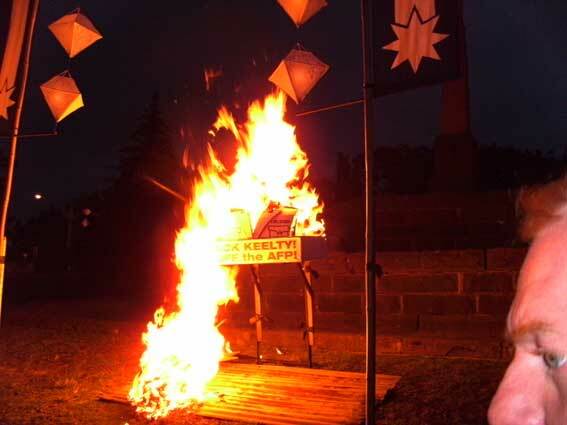 The burning took place after an hour or more of this oratory and heart felt statements and in the witness of those friends in Eureka spirit; in the witness of their digital cameras too and the video cameras of a public Tv documentary making team and a cameraman from WIN TV Ballarat. First light was in the sky. At the time 154 years previous, the attack by the British red coat regiments and the colonial mounted police began and the ruthless suppression of the rebellion took place. 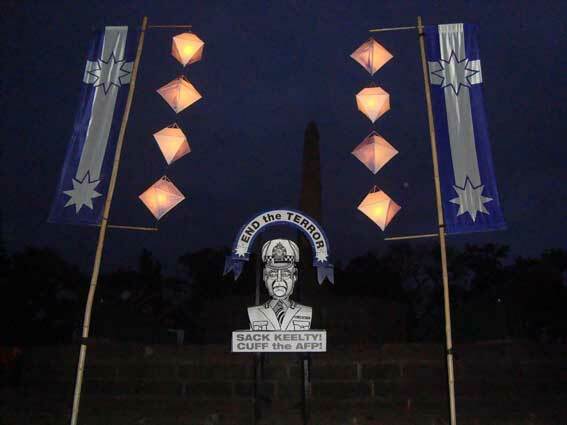 I introduced the burning saying that it had been the corruption, violence and abuse of power of the Victorian Police (just one year old at the time) that had turned the diggers' discontent with the license tax, a discontent that was wide spread in the various gold fields of the colony, into open rebellion in Ballarat; that it was the arbitrary arrests of five diggers in the crowd watching the burning of Bentley's Hotel, (they were marched to Melbourne in chains and sentenced to 6 months hard labour in Melbourne jail) that had transformed discontent into outrage, requests into demands, and public oratory into armed rebellion. I reminded those standing beside me in witness, that Mick Keelty as chief commissioner for the AFP had served as the point man for the Bush/Howard Terror War in this land. Forty different pieces legislation were passed under the Howard regime and with the support of the ALP Opposition, to wind back our hard won rights and liberties. 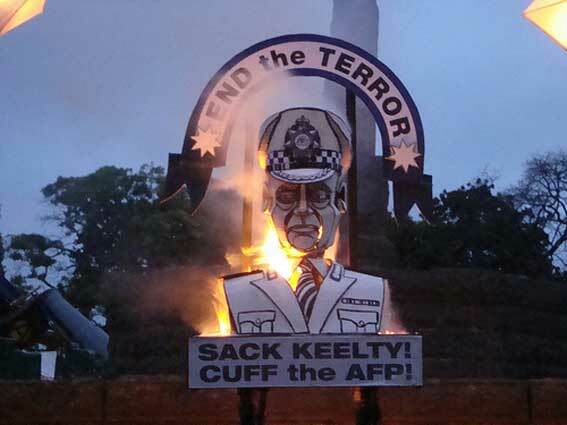 The AFP had been invested with extraordinary powers of surveillance, arrest and detention, and under the highly politicized command of Mick Keelty, these powers had been inevitably and seriously abused. 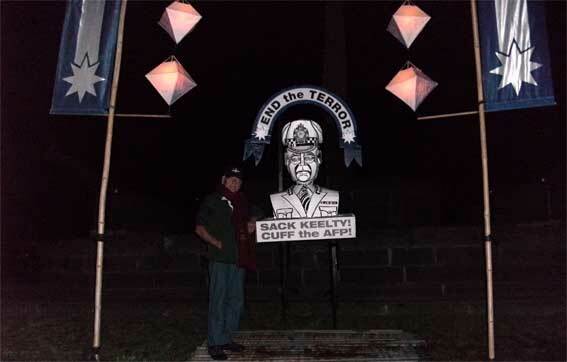 The list of abuses is long and it includes the subversion of the ban of the death penalty in this land by the AFP arranging to have the Bali Nine arrested in Indonesia April 2005 and so face the death penalty there and teach other drug mules a lesson. It includes the AFP people smuggling disruption operation that led the teach-them-a-lesson drowning of a 353 refugees (including 145 children) who had been aboard the over crowded and leaky vessel now known as the SIEVX on 17 October 2001. This was calculated evil at its worst. It includes the arrest, detention, public vilification and show trials of the Barwon Twelve and the Goulburn Six, Australian muslims accused plotting terrorist acts. The evidence reveals these were mere thought crimes, that their association was under intense AFP surveillance and that AFP undercovers had actively fostered plans for bombings to the extend of teaching them how to make explosives out of fertilizer. Why? To justify the extraordinary Terror War powers bestowed upon the AFP by Howard regime, the AFP command had deliberately chosen to abuse them. And the AFP abuse of its power includes the arrest, detention and vilification of Dr Haneef. The recent report of the Clark inquiry had established that the AFP were informed early that there was no evidence of Haneef's complicity in terrorist activity but they pursued him none the less as "a person of interest" for another 8 months. Why? 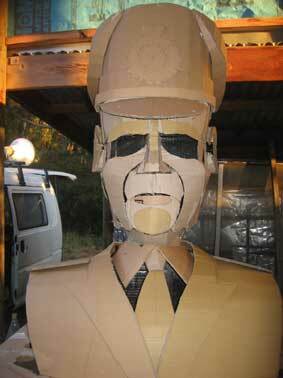 To create a Terror War media beat for Howard in the run up to the federal elections of 2007. Rather than release the report of the Clark Inquiry into this particular abuse of powers, in the days before our Eureka observance, the federal Attorney General McClelland had announced the report would be shelved and in response to widespread calls to sack Keelty, he had said the Rudd regime would not. Too weak kneed! Effigy burning is highly charged symbolism; it creates a strong visual image which expresses the fire of dissent, the fire of transformation. 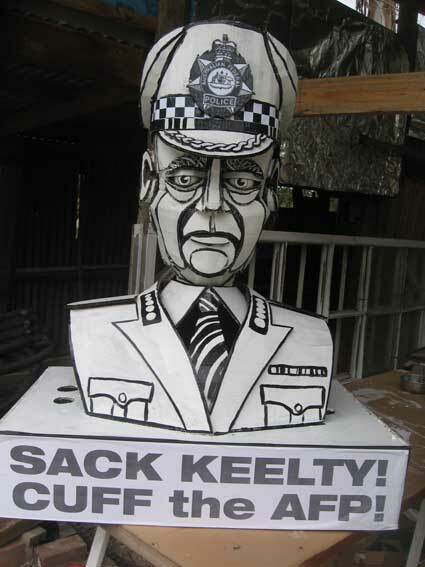 Keelty and the pusillanimous Rudd government have got to understand the heat that lies behind the demands for his sacking. The Terror War is and has always been a media beat up based on lies. Now with the defeat of Bush and Howard, the fabric of lies goes more threadbare with every passing day. 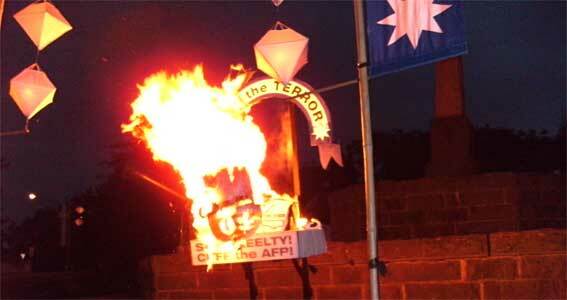 Keelty must go, the Bush/Howard Terror War must be declared over and the Terror laws repealed. 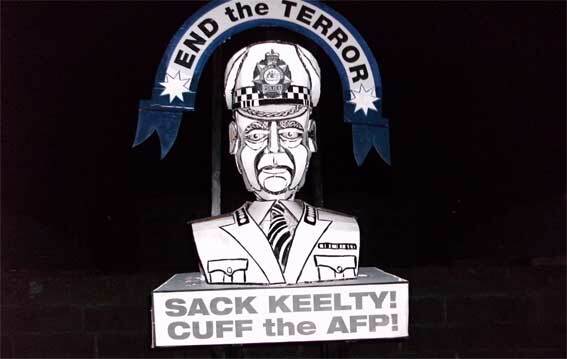 And Keelty must be publicly disgraced so that future commanders of the AFP will be more reluctant than Mick about walking down the politicized path and abusing rights and liberties of Australians in order to aid and abet fear mongering of political masters. End the Terror! Sack Keelty! 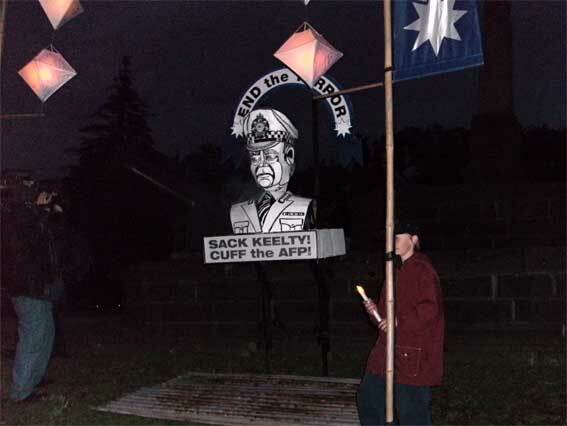 Cuff the AFP! 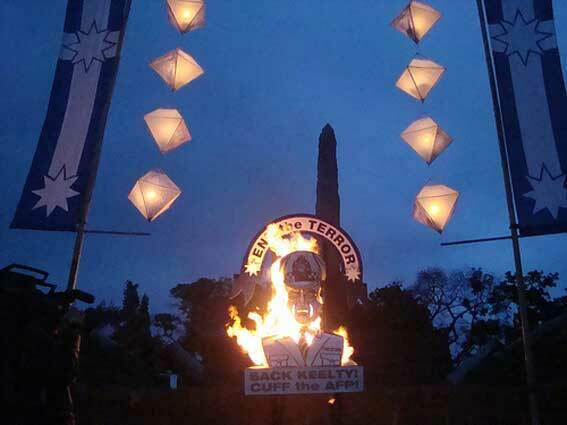 The slogans were there on the effigy and the words End the Terror were presented on a blue Eureka ribbon, eight pointed white stars at either end. 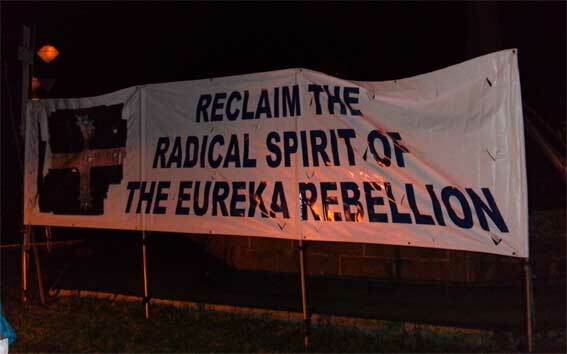 Eureka spirit! While I held his horse, my 8 year old Ballarat friend, Eddie, who was the youngest of the witness group, used a candle to light the tinder at the rear of the effigy. Just one candle disperses the dark, said the Buddha. But the horse was a a stuffed one, Eddie's comfort toy. It was a big thing for him to be up so early. 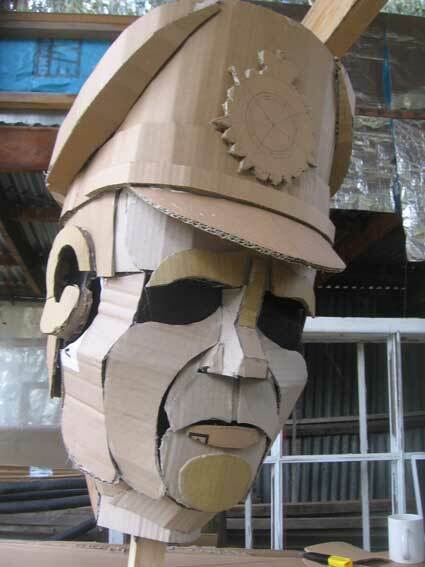 The effigy began to smoke; then flames emerged through the collar, from inside the face and out the top of the cardboard cap. The tentative first flames quickly became a blazing column as more cardboard took fire. Then the head toppled, fell and rolled, a ball of fire on the ground. Mick Keelty's head had rolled! Hear us Mick! 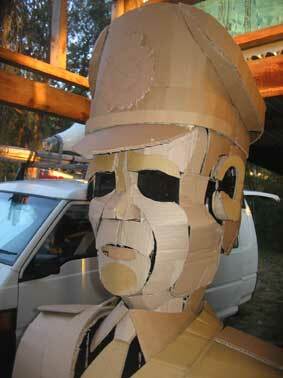 Prophecy of the ancestors: your time as chief commissioner of the Australian Federal Police is coming to an end. Your credibility is shot and your continuing command of the AFP is now a liability to the ranks and the federal government. As far as media goes - and you loved to play the media with leaks and public statements - you are walking wounded and visibly bleeding credibility. Only a matter of time before your resignation is negotiated or a sacking imposed. 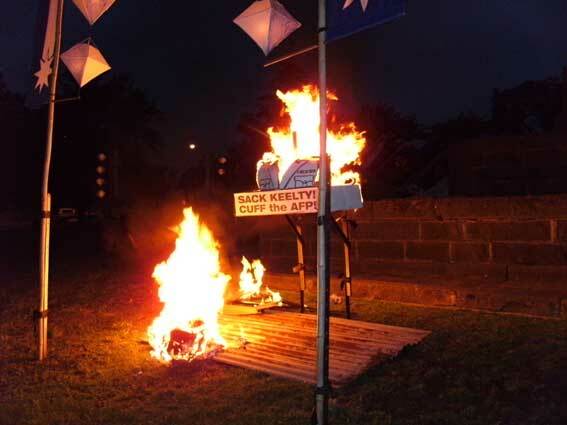 And this just the first of the Keelty burnings. How many will it take? 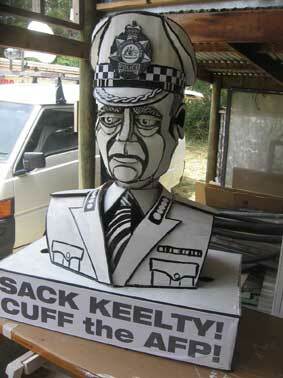 The cardboard bearing the slogans "Sack Keelty!/Cuff the AFP!" was the last to burn and we comrades in dissent warmed ourselves on the embers as the sky brightened and smoke drifted across the lawns. Evocative. The smoke of the Eureka stockade camp fires must likewise had drifted across the killing grounds of that fatal morning 154 years ago. Tangible was Eureka spirit. 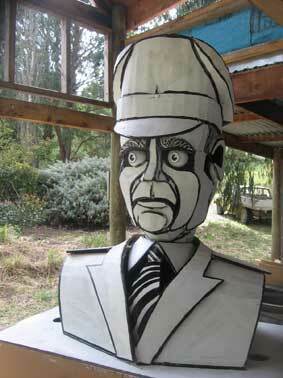 Postcript: Our fears that Prime Minister Rudd is continuing and escalating the Bush/Howard Terror War are confirmed here. So it goes: Rudd is a dud, just another US Alliance stooge like Howard and maybe more so. More government lies to be expected; more wars and more taxes spent on preparing for wars; more terror and more terror trials. The struggle for peace and justice goes on. ALP = Alternative Liberal Party.